- Plus An Electrical Storm! When the musicians of Wingates Band ventured across the Pennines last Sunday (July 5), for their latest challenge in the contest arena, held deep in Yorkshire's brass band heartland, they knew they would face stiff competition from the 26 other competing bands, but little did they realise that arguably the biggest challenge to be faced would be that of the violent vagaries of the British summer weather. Wingates were competing in the renowned Brighouse Brass Band March and Hymn Tune competition, an outdoor contest (now in its 16th year) organised by Brighouse Lions Club, which provides a stirring climax to a wonderful three-day brass band festival. All participants in the contest proudly march in turn down the main street of Brighouse to the contest arena, prior to assembling in traditional outdoor contest format, and playing their own-choice March and Hymn Tune. Drawn to play 17th of the 27-band entry, the Wingates contingent were interested onlookers as the first 15 bands played before a large and enthusiastic crowd basking in glorious sunshine, but as Wingates prepared to start their march down the High Street, the skies suddenly darkened as an electrical storm approached. As the Wingates players bravely performed their two contest pieces, the rain became increasingly torrential, to the point where many of their music scores simply disintegrated before their eyes. What a good job it was, therefore, that the band had been so very well rehearsed prior to the contest by Musical Director, Paul Andrews, and, despite the disconcerting thunder and lightning overhead, the Wingates musicians resolutely completed their task, with the test pieces chosen by Wingates being George Allen's Knight Templar march, and John Ireland's beautiful hymn tune, Love Unknown. After such a traumatic experience, the Wingates musicians could be forgiven for thinking that at best they might be amongst the 'also-rans', but it is a tribute to the excellent ensemble which has been moulded by Paul Andrews over the past two years that the two adjudicators – judging 'blind' in a caravan adjacent to the contest arena – awarded Wingates first prize in both the categories. With the overall winner of the contest being the band with the lowest aggregate 'placings' total, Wingates were, of course, unassailable, and were presented with the prestigious Brighouse and Rastrick Trophy, plus a most welcome cash prize of £600. Despite having entered this contest on numerous previous occasions, this is the first time Wingates have emerged triumphant, and is further evidence of the tremendous resurgence of the historic band's fortunes under the baton of Paul Andrews over the past two years. With a number of other important contest successes over the past 18 months, Wingates have climbed steadily up the world rankings, and this latest success should help propel the band even further to the top echelons of the British banding movement, where Wingates have featured so prominently and proudly for well over a century. Press Release, 8th July 2015. 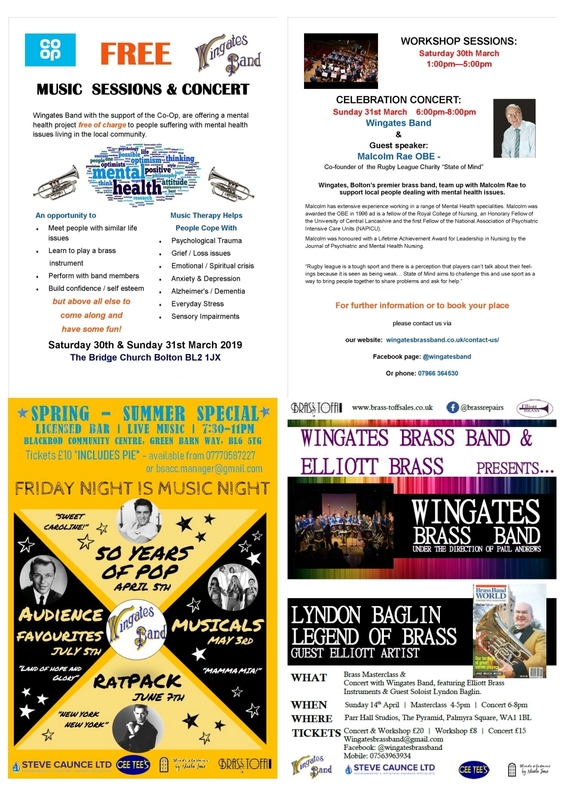 Visit Wingates Band website for latest news and concert information.